It is easily recognised by always appearing on the place. The dust spots are most noticeable when shooting a uniform bright object (e.g. sky) with small aperture (f/22 or smaller). And cleaning the lens will not get rid of the spots. The right way to address it is to clean the sensor. Someone else wrote about it. Let's talk about how to remove these spots from the photos already taken. For this purpose I use Gimp and its Resynthesizer plugin. Clone brush is OK too, but cleaning more than a photo or two is tiresome. Think of Resynthesizer as an automatic clone brush. 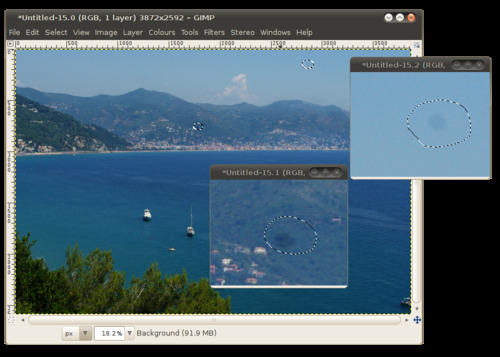 Ubuntu users may install it with gimp-resynthesizer package. To clean dust spots, first find and select them. I usually use a free selection tool . Press Shift to add more than one spot to selection. Select also a handful of “clean” pixels around. Which pixels are on the border of the selection matters. Run Filters -> Map -> Resynthesize filter. 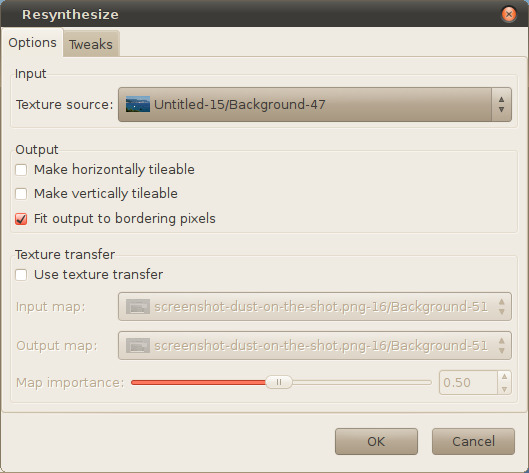 Default parameters should be OK, tiling options are not necessary for our scope. Now you have to wait a few seconds. Resynthesizer takes some time to redraw the selection. Anyway, it is faster than manual clone brush. Also in Russian: Удаление пыли на матрице в Gimp.